Normally we celebrate birthdays here on the site, but the birth date of poor little Fanny Adams is unknown. What is unfortunately known is the the day she died—August 24, 1867. Fanny Adams was born in 1859 in Hampshire, England. 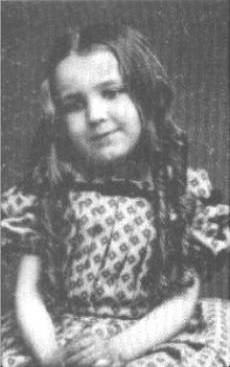 When the child was only eight years old, she was brutally murdered and dismembered by Frederick Baker, a twenty-nine-year-old clerk. Parts of her body were flung all over a hops field, and it apparently took days to piece her back together. Baker protested his innocence, but the blood on his clothes, the two blood-stained knives, and the entry in his diary that said “24th August, Saturday — killed a young girl. It was fine and hot” convinced a jury otherwise. Despite making a plea for insanity, he was publicly hanged in Winchester on Christmas Eve, 1867. Unfortunately, the indignities for poor Fanny continued two years after her death when the Royal Navy began issuing new rations of unappetizing tinned mutton. Joking that the victuals must be the chopped remains of Fanny Adams, the catchy name stuck and came to be used for all mystery meat. In time, the large tins that delivered the meat came to be called “Fannys,” as did the mess kits and cooking pots used to prepare it. Believe it or not, it gets worse. The final transformation for dear Miss Adams began when sailors further adapted her name to mean “nothing at all” or the more emphatic “f*** all.” It is not uncommon to hear “Sweet Fanny Adams” or, more often, the shortened “sweet F.A.” cursed aboard a British vessel. Though it is principally a British phrase, it has recently made its way across the pond into American urban slang in its obscene capacity. The more sympathetic citizens of Fanny Adams’s community all pitched in on subscription to give her a proper headstone. It reads, in part, “Fear not them which kill the body but are not able to kill the soul but rather fear Him which is able to destroy both body and soul in hell.” There are some in the Royal Navy as yet unsatisfied with merely invoking Fanny’s name for their rustic rations who also refer to steak and kidney pudding as “baby’s head.” One can only assume that a special circle of hell awaits them.